The latest official figures have shown that the number of people employed in Scotland is the highest it has been in five years. There are now well over two and a half million people working in the country, showing a rise of around 37,000 between May and August 2013. With the number of those employed standing at more than 2,500,000, there was further good news with the unemployment figure in Scotland. This dropped by 3,500, with just over 120,000 people claiming jobseeker’s allowance in September. Through the summer of 2013, there were more than 200,000 people out of work. The data from the Office for National Statistics (ONS) also showed that the Scottish unemployment rate (7.3 per cent) is lower than the national average, which is presently standing at 7.7 per cent. Other official figures released further strengthened the idea that the recovery is gaining speed. Between April and June of this year, the economy in Scotland saw its fourth successive period of growth. It rose by 0.6 per cent, showing that firms, many having shored up their finance with invoice factoring, are seeing increased levels of business. Michael Swinney, the Finance Secretary, was also encouraged by the latest data. 'Disclaimer: The information contained in these articles is of a general nature and no assurance of accuracy can be given. It is not a substitute for specific professional advice in your own circumstances. No action should be taken without consulting the detailed legislation or seeking professional advice. Therefore no responsibility for loss occasioned by any person acting or refraining from action as a consequence of the material can be accepted by the authors or the firm. A Scottish based packaging firm has made 90 redundancies in one of its operations south of the border, following the loss of a major contract. How do I choose between factoring companies in Scotland? How does asset finance work? How does invoice factoring work? 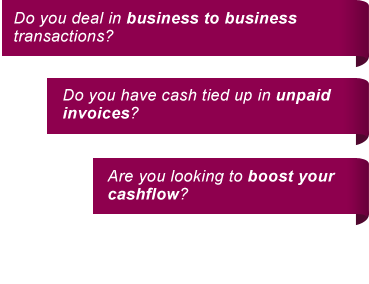 Is invoice factoring suitable for every business? Is Scottish factoring a good way to raise capital? What are the different forms of asset finance? What are the disadvantages with invoice factoring? What can a commercial finance broker do for me? What commercial finance options are available? What is invoice factoring and who can use it? What is meant by construction finance? What should I consider when looking for an invoice finance broker? Who can benefit from construction finance? Who can use the services of an asset finance broker?